Summertime means more people are out and about – off from school, taking vacation, working around the house, etc. Fleet drivers need to be vigilant when they are driving, as they are your company. Driving a business vehicle isn’t always easy. Fleet transportation typically has a logo on the side, which means greater visibility on the road and in the community. The benefit is built-in marketing. However, any aggressive driving, real or perceived, can negatively affect a brand. The goal is to protect the driver, vehicle and company’s reputation, so let’s review two types of unsafe driver behavior. Rapid accelerations seem harmless, yet a regular habit of starting fast from a stop stresses a vehicle’s drivetrain components. It could even affect the brakes if your driver has to slow suddenly. Fast starts burn extra fuel even in all-electric vehicles, and translates into higher operational costs, including more maintenance. From the community perspective, quick accelerations are often loud which make people notice, and take note. The aggressive action could also leave marks on the pavement leading to increased tire wear. The reasons for hard braking are more of a grey area. Some situations are out of a driver’s control, such as someone running out in front of the vehicle or a sudden stop ahead of them. However, speeding and distracted driving can also be factors. Regardless, hard braking can unbalance a vehicle as it shifts all the weight forward and increases the likelihood of skidding depending on the speed, as well as loss of control. What does slamming on the brakes do to the vehicle? Popular Mechanics notes that applying your brakes, in general, “causes heat to build up in the brake pads and rotors, causing wear and increasing the risk that they will overheat or warp.” Hard braking also can increase the wear-and-tear on the tires, especially if skidding happens. This type of aggressive driving increases the need for more frequent maintenance. In regards to your brand, harsh braking can be loud and give the perception of bad driving if the entire situation is not seen. Some fleets are supplementing telematics solutions with in-dash cameras to provide more information. 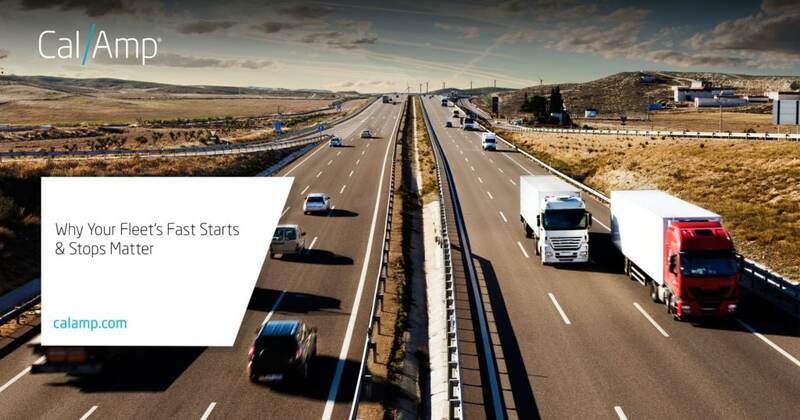 How is a fleet manager going to know when a fast start or stop occurs? A popular way to monitor fleet activities is on a map that shows any incidents as they happen or in a breadcrumb detail of a driver’s route. Depending on the solution, there are additional layers of information such as speed limits, traffic issues and even the current weather. The second way to gain insight is through real-time alert notifications. Fleet managers can define the parameters for when an alert triggers and requires an immediate response, such as two hard braking incidents within 20 minutes. Lastly, there is the driver scorecard that presents an overview of driver behavior during a certain period, including any exceptions. With this snapshot of data, the manager will be able to quickly identify which drivers could use additional coaching. How should fleet managers apply the information? The breadcrumb and driver scorecard reports provide insight into individual and overall trends in driver behavior. Perhaps, incidents are higher in particular neighborhoods, during a certain time of the day or with a certain class of vehicle. Below are some ideas for putting the data into action. The result should be safer driving behavior that protects your drivers and the community while also reflecting positively on your brand. Visit CalAmp’s Commercial Fleets page for more information.